An online film degree is an excellent option for students who want to turn their love of movies into a career. With digital streaming platforms disrupting legacy distribution models, the film and television industries have grown enormously in recent years as global demand for professionally produced entertainment surges. The U.S. Bureau of Labor Statistics (BLS) projects a 13% increase in demand for camera operators and film editors by 2026. A bachelor’s degree qualifies graduates for entry-level positions in areas like producing and directing. An undergraduate film degree is also an ideal starting point for students interested in the academic or technical sides of the movie industry. What Else Can I Expect From an Online Bachelor’s in Film Program? 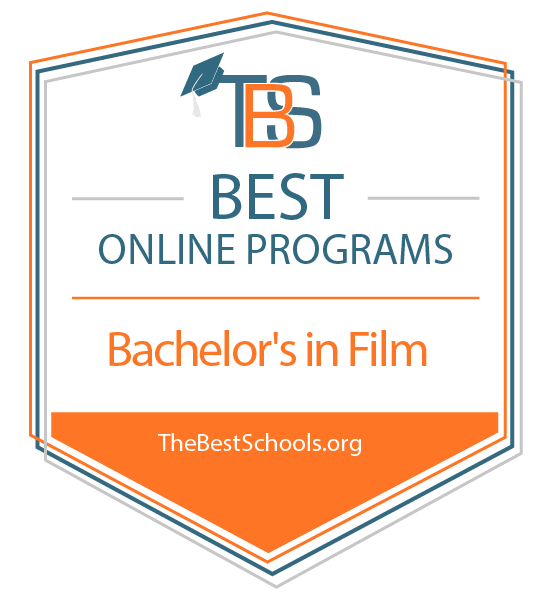 Online Bachelor’s in Film Degree Program Ranking Guidelines: We selected the degree programs based on the quality of program and range of courses provided, as well as school awards, rankings, and reputation. Arizona State University’s online bachelor of arts in film and media studies focuses on emerging trends and disruptive changes affecting the global entertainment industry. Students gain advanced film and media literacy capabilities, along with critical thinking skills that translate well to positions in the field. Students pursuing the online film degree take 39 classes for a total of 120 credit hours and can customize the program through a variety of electives. The curriculum emphasizes writing skills and includes intensive discussion components to engage students. Graduates have secured high-profile jobs in movie and television development, video game production, and film distribution. The University of Montana’s online BA in media arts program emphasizes the development of practical skills that help students secure jobs after graduation. Learners take 15 three-credit courses during this four-year program. Topics with direct professional applications include film editing, digital image editing, coding, vector and layout design, and web design. While earning the online film degree, students prepare for artistic and technical media careers and gain comprehensive, flexible skill sets applicable to future learning. Online students have access to the school’s comprehensive collection of assistance and support facilities, including a writing center, veteran student resources center, and library network. The University of Montana is regionally accredited by the Northwest Commission on Colleges and Universities (NWCCU). Grand Canyon University, a private, non-profit Christian University, offers an online bachelor of arts in digital film degree program with two emphasis options, in production, or screenwriting. Regardless of emphasis, the online degree program prepares students to pursue careers as leaders in the art of narrative film development. Students complete 120 credit hours, engaging with fundamental concepts in courses, such as visual storytelling, history of the field, digital production, production management, and editing. The program develops in students the knowledge and skills necessary to approach digital filmmaking from a professional stance, whether working on small productions or major motion pictures. Students explore the field through technical, aesthetic, and business-oriented approaches. Online courses utilize a seven-week schedule, allowing for focused yet flexible studies. Grand Canyon University is regionally accredited by the Higher Learning Commission (HLC). National University, a private, nonprofit university, offers an online bachelor of arts in film arts degree program that prepares students for entry level positions in professional film and media production settings. Students develop the knowledge and skills necessary toward acting as an effective part of a film or media production team, applying principles of filmmaking, communicating objectives, and collaborating. The online BA program requires 180 quarter-credit for completion, with courses covering fundamental concepts such as audio and video editing, directing, producing, screenplay writing, and narrative cinematography. Students must also complete two capstone courses. Full Sail University, a private, for-profit university, offers an onlinebachelor of science in digital cinematography degree program for students seeking to enter careers in filmmaking. The program focuses on developing thorough knowledge and skills in fundamental areas, including familiarity with different media formats and technology, directing, audio, postproduction, digital editing, and team management. The coursework blends hands-on learning with theory and discussion. The online BS program requites 120 credit hours, and can be completed in 29 months of continuous coursework. Each course lasts one month, taken one or two at a time. The program concludes with a portfolio of work completed over the length of the program, and three career modules designed to prepare students for entering the professional world. Full Sail University is nationally accredited by the Accrediting Commission of Career Schools and Colleges (ACCSC). Most online film programs focus on production or theory. Production-oriented programs teach students about the technical side of filmmaking, covering topics such as camera operation, sound recording, film and video editing, production design, and budgeting. In the film and TV production industry, most professionals specialize in a particular area, such as cinematography, lighting, editing, or sound recording. Many online film bachelor’s degrees include flexible elective requirements that allow learners to focus their studies on one or more areas of interest. For example, a student planning to become a camera operator may take an intensive series of electives that cover basic, intermediate, and advanced topics in cinematography. This specialization would help the student prepare for an entry-level position in the camera department of a professional film shoot. Theory-focused programs explore topics such as film history, film criticism, and the social impact of film. These programs appeal to students with an academic or intellectual interest in film as a cultural phenomenon. Theory-oriented programs also provide a strong educational background for students interested in film development, acquisition, distribution, and other business-oriented aspects of the entertainment industry. Because of the variety of specializations available to students in online film studies degree programs, curricula vary significantly. However, students in both production-oriented and theory-oriented programs gain an understanding of certain fundamental concepts. The foundational courses below are common to most online film programs. Most online film school degrees begin with an overview of movie history. These courses cover the development and emergence of motion picture technology. Students examine the first century of filmmaking milestones, focusing on noteworthy films, filmmakers, and cinematic movements. While most people associate filmmaking with the commercialized entertainment industry, film has rich non-narrative tradition. This course introduces students to the many auteurs who have explored film’s formal characteristics purely for artistic expression. Movies can profoundly affect viewers, creating powerful intellectual and emotional responses. This course explores how movies achieve this effect and why some films are more effective than others. Students discuss whether films can be judged according to an objective set of criteria or whether evaluating a film must always involve a degree of subjectivity. More commonly found in production-oriented programs, film business classes introduce the basics of film financing models, budgeting, and distribution channels. Students gain foundational knowledge to prepare for careers in the entertainment industry, and emerging filmmakers learn to consider the practical aspects of the creative process. Tech courses focus on particular classes of filmmaking equipment, such as cameras, lights, sound recording devices, or special effects technologies. Students learn about the proper setup, calibration, use, and maintenance of these tools and learn how to utilize technologies to achieve specific stylistic effects. Online film degrees prepare learners for career opportunities in the practical, technical, and creative sides of filmmaking. In the film and television industries, demonstrable skills tend to impact career opportunities more strongly than formal education. A bachelor’s degree is sufficient for most entry-level careers in the industry. Editors play a key role in post-production. They work in editing bays to assemble raw footage into the polished scenes that comprise a finished film or TV show. These professionals need detailed technical knowledge of computer hardware and editing software, which students gain while completing a production-oriented online film bachelor’s degree. Camera operators work closely with creative leads, known as cinematographers, to achieve the desired look, tone, and mood of a film or TV production. Under the direct supervision of the cinematographer and/or director, camera operators draw on film school training to calibrate and physically operate the camera equipment used to capture individual scenes. Producers acquire and develop source material, secure financing, and serve as the lead point person on business aspects of film and TV projects. Directors specify creative and dramatic visions for the finished product and work on set to provide cast and crew members with detailed instructions. These competitive positions require knowledge of the creative, historical, and practical aspects of filmmaking.